It's been quite a while since I discovered the existence of blackboard paint - paint that creates a blackboard surface. 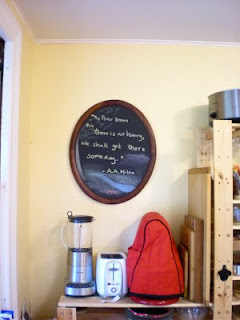 While I enjoy the idea of a blackboard wall (how I originally saw the paint used), our kitchen has no feasible walls for this purpose. After one of the last kitchen-reorganizations we ended up with a big empty space on one wall. patient task of waiting to find the right piece. I then saw Edgefield Farm's farmer's market signs and I knew I'd found our answer. Now I just needed a frame to make it look nice. As I wanted a rounded frame, and not just a standard square, I knew my best bet would be to find one used. While doing some errands in Brattleboro, VT, we popped in to the local hospice thrift store and right there on the first table was an oval mirror with a beautiful frame! It definitely needed some love so I removed the mirror and spent a bit of time gluing, sanding, and treating the wood frame. I added a notched wood bar across the back and voila! and look forward to having yet another simple creative outlet. What a great idea - I love the use of colored chalk to add more depth (in painting form) to what might otherwise be a very flat surface. It almost looks like a small window with that phrase painted on it.